Good to keep in mind! She is a fascinating woman. blogs know that i look daily. i think it's nice to know that? happy new year, and keep up the good! I linked to your "corita rules" image file on my site -- please let me know if that creates any problem for you. the perfect list for a week full of resolutions. i love this. every single one. especially the need for separation between creating and analyzing. that is often where I get caught. here's to new practices. happy new year dear! This is wonderful.. Thank you for putting this out there. Perfect and beautiful rules for everything really. Thank you for posting this. Those are some rules to live by. And congrats on the little one to come. 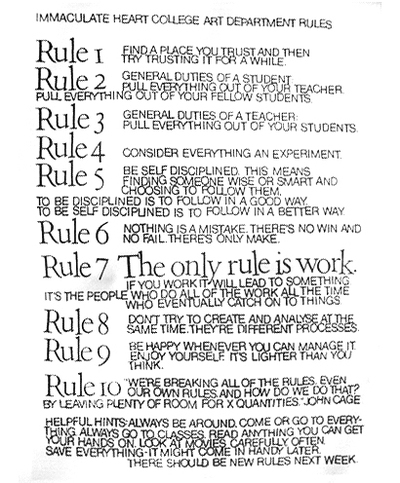 Fantastic rules... and still applicable today. May I ask you for the official source? Thanks a lot! Love the rules. What a neat blog. A failure is a man who blundered, but is not able to cash in on the experience. The ceramics teacher announced on opening day that he was dividing the class into two groups. All those on the left side of the studio, he said, would be graded solely on the quantity of work they produced, all those on the right solely on its quality. His procedure was simple: on the final day of class he would bring in his bathroom scales and weigh the work of the “quantity” group: fifty pounds of pots rated an “A,” forty pounds a “B,” and so on. Those being graded on “quality,” however, needed to produce only one pot—albeit a perfect one—to get an “A.” Well, came grading time and a curious fact emerged: the works of the highest quality were all produced by the group being graded for quantity. It seems that while the “quantity” group was busily churning out piles of work—and learning from their mistakes—the “quality” group had sat theorizing about perfection, and in the end had little more to show for their efforts than grandiose theories and a pile of dead clay. It doesn’t matter whether your objectives are in the area of art, business, ministry, sports, or relationships. The only way you can get ahead is to fail early, fail often, and fail forward. Hmm.. Its very interesting post. Good luck in the future. Thanx! Good information looking forward to read more from you. Thanks! Great list. The only one that I would change is the one on work. It is important to choose the right thing to work towards. It seems that while the “quantity” group was busily churning out piles of work—and learning from their mistakes—the “quality” group had sat theorizing about perfection. i love these rules! they are written originally by john cage, and typeset by sister corita, i believe. thanks for posting!! the perfect list for a week full of resolutions. i love this. every single one. especially the need for separation between creating and analyzing.